AZUT + UUSIKUU | who's that knocking...? David Stent (Guitar), Dominic Lash (Double Bass). 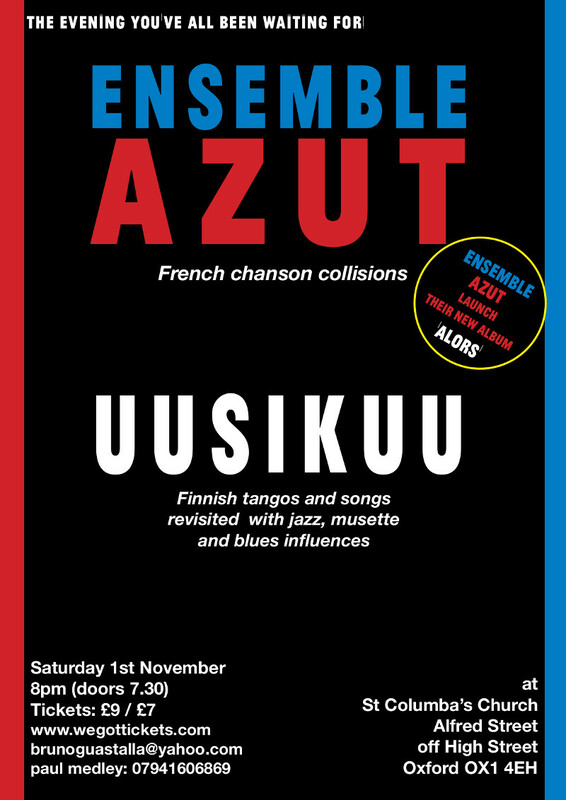 Uusikuu are one of the most interesting and original interpreters of that rare and rather special genre, the Finnish tango. Uusikuu revisits the haunting and melancholy Finnish rhythms and melodies from the 1930s and 1940s, the glowing voice of Laura Ryhänen acting as a tour guide to a journey into that uniquely Finnish world. In the past eight years,Uusikuu has released two albums and performed at concert halls and festivals across Europe and has also been involved in several theatre and film productions. Norbert Bremes (Accordion), Leo Laikola (Guitar), Dominic Lash (Double Bass).